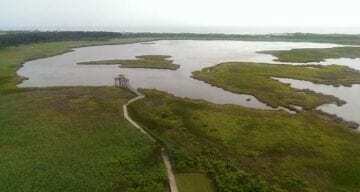 The National Park Service has approved a plan to build a new accessible hunt blind and wildlife-viewing platform within an authorized Cape Hatteras National Seashore waterfowl hunting area on Bodie Island. The purpose of the EA was to evaluate the effects of building an accessible hunt blind that complied with the 1968 Architectural Barriers Act (ABA) and protect ecological features. NPS selected the preferred alternative for 265-foot-long blind and viewing platform at the site of an old platform. It will include a five-car concrete parking areanext to the highway. The project will enhance recreational opportunities at Cape Hatteras National Seashore by providing an ABA accessible hunt blind and wildlife viewing platform within a wetland environment for use by all visitors. Copies of the EA and the FONSI can be found on the NPS Planning, Environment and Public Comment website at: http://parkplanning.nps.gov/caha_accessible_HuntBlind_WildlifeViewing. Thank you! I had given up on duck hunting the flats some time ago. Now all I’ve gotta do is live until fall.